On this date in 1918, April 21, the Red Baron was finally and permanently shot down. Who actually killed Manfred von Richthofen remains a bit of a mystery; he was pursuing Canadian pilot Arthur “Wop” May and briefly engaged another Canadian, Arthur “Roy” Brown but was almost certainly killed by an Australian anti-aircraft gunner, likely Sgt. Cedric Popkin. A bigger mystery to me is the mystique surrounding him to this day. He was, of course, a superb combat pilot. His official 80 victories top the list of World War I aces, with France’s Rene Fonck just 5 back at 75 and Canada’s Billy Bishop at 72. Von Richthofen is far behind the all-time leader, Erich Hartmann, credited with 352, but flying on the Eastern front in World War II Hartmann benefited from far more advanced technology and a far bigger technological advantage over his numerous Soviet foes. 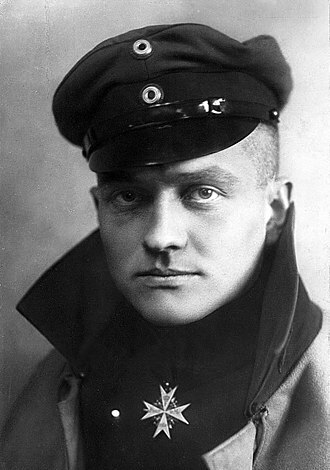 The Red Baron was determined, skillful, an excellent leader as well as solo flyer and keenly interested in the technical aspects of fighter aircraft. And had he fought for a better cause he would be celebrated for his contribution to it. But there is a mystique around him that is slightly puzzling, and not to be explained solely by Snoopy’s obsession with him. Like many cult figures, he has a fey side not to be overlooked. He was a cold, distant man with an impressive theatrical streak including the business of defiantly painting his planes red after January 1916, scorning camouflage, and also ordering an engraved silver cup to celebrate each victory until Germany’s silver shortage made it impossible, and refusing to continue with base metals. And he was associated with the aircraft, a symbol of modernity whose potency in those days is almost impossible to recapture now that smartphones are old news. So yes. He had style. And a title, which some alleged egalitarians find strangely fascinating. Incidentally he was not really a “baron” in the sense that we understand it. An aristocrat, he held the title “Freiherr” or “free lord” but it is not hereditary; all male members of his family were entitled to it, even while their fathers were alive. In Germany he was better known as Der Rote Kampfflieger (literally “The Red Battle Flyer” but more fluidly “The Red Fighter Pilot”, which was the title of his 1917 autobiography. He was good at killing. He seems to have liked it. And he perished as he had lived, just 25 years old. What, indeed, would he have done otherwise? What could he have done? His brother Lothar, a distinguished ace in his own right with 40 credited victories and a bolder flyer, survived the war only to die in a plane crash in 1922 survived by an actress passenger and her manager. So yes, an impressive pilot. But hardly an attractive human being, and not one who put his somewhat questionable talents to a cause that would at least partly redeem them. I would like to think so. But I’m not persuaded. And while he was a remarkable man, I do not know that he deserves to be admired except on technical grounds. His mystique I find odd and off-putting.